1) Debugging remote sessions – where you do not want a new session, instead want to connect to running session. 2) Maintaining running session from another PC. If you are running some applications on some Linux box and want to gracefully stop it using some commands other than kill -9 then it is best that you connect to the running session, if you are not using screen. : connect to a running GNOME session using VNC. Once installed, you do not need to start any service to start vino (albeit it will not appear in services menu). It will be automatically started when your session starts. 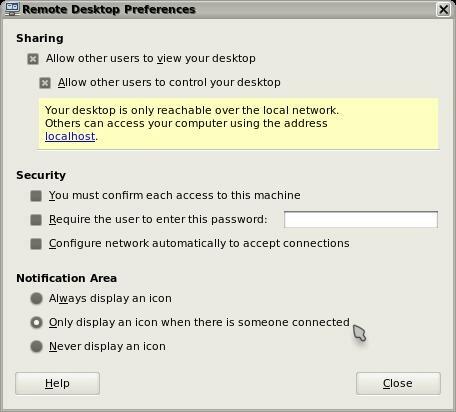 or through the menu option “Remote Desktop Preferences” in System menu. Set your preferences here and specially check the “Allow other users to connect to my desktop”. This should be set so that other users are able to connect to your system. Hope you like the application.